Meningitis, sometimes called spinal meningitis, is an infection of the meninges, the coverings of the brain and spinal cord. In particular, the infection is generally centered in the cerebrospinal fluid, the fluid surrounding the brain and spinal cord in the subarachnoid space. Therefore this is not an infection of the brain or spinal cord itself. However, it can have a profound effect on the adjacent nervous system. There are several types, generally separated by the causative organism which cases the infection. The most common types are bacterial and viral in origin. Less commonly, infection in this area can be caused by various fungal organisms. Transmission of the causative bacteria or viruses can generally occur by direct contact with an infected individual or from spread through the bloodstream from another source. The most common symptoms include headache, neck pain/stiffness, photophobia (avoidance of bright lights), nausea and vomiting and fever. As it progresses, the patient generally has a deterioration of their level of consciousness, particularly with bacterial forms of the disease. More information about symptoms can be found on the Meningitis Symptoms page. If a patient presents with signs and symptoms that are typical of this type of CNS infection, a lumbar puncture is generally performed. A lumbar puncture, or spinal tap, is a procedure which introduces a thin needle into the space in the spine where cerebrospinal fluid can be collected. The fluid is sent to a laboratory to be evaluated for several things, including levels of glucose and protein. Additionally, the fluid is examined microscopically to assess for the presence of white blood cells and bacteria. Finally, the fluid is cultured to attempt to isolate and identify the causative organism. 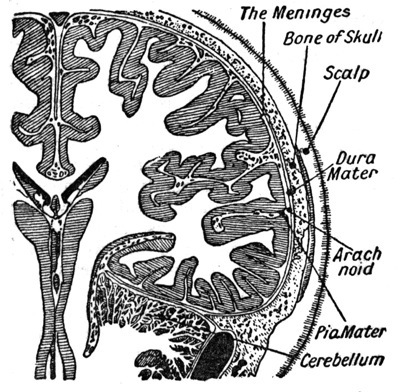 Treatment for general, uncomplicated meningitis depends on the type. Viral causes are generally treated supportively and are self-limited in nature. Bacterial causes must be treated aggressively with intravenous antibiotics. These patients are generally hospitalized and given intravenous antibiotics until the infection has been controlled. More information about treatment can be found on the Treatment page. The optimal management of each patient can vary considerably depending on the type of infection that is present. Therefore, each patient should consult their own treating physicians regarding the recommended course of treatment. Done with the Meningitis page? Return to the CNS Infection page.